Finding a good birthday gift is hard. It’s especially tough for someone who’s turning 80 years old. By that time in life, you’ve pretty much gotten everything. But this 80-year-old was Bill Klemish. He lives in Florida now, but still remembers the 1950 Staples football team. He was captain, and they were undefeated. A quick note to Dan DeVito — president of the Staples Gridiron Club — was all it took. Dan sent a Wreckers sweatshirt, and a nice note. 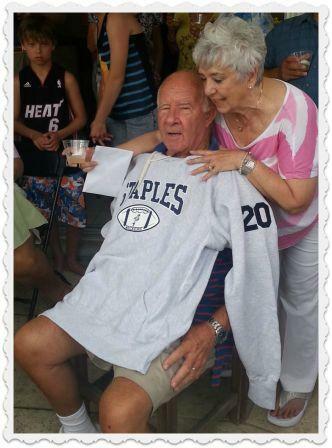 Bev Breault (Staples Class of 1952) presents Bill Klemish with his Staples football sweatshirt. The guests at Bill’s party — held at his daughter Marilyn’s home near Sarasota — could certainly relate to Staples. Their names read like a Who’s Who of Westport: Marge Santella, Bev Breault, Carole Maddock, Ann and Don Rully, Barbara Allen Yamnicky, Bunny Maier, Jack Lauterbach, Bob Duffy, John Hastings; Bill, John Michael and Mary Kate Klemish, Florence Dohanos, Linda Gilchrist, Jenny Walton, Bill and Mary Ann Stirling, Althea D’Aiuto, Jessie Huberty and Ardela Whortley. Ray Maddock was there too. He and Bill have a lot more in common that Staples football. They’ve been friends since kindergarten in Westport — 75 short years ago. This entry was posted in Looking back, People, Sports, Staples HS and tagged Bev Breault, Bill Klemish, Staples Gridiron Club. Bookmark the permalink. Happy 80th Willy and many more!! Willie was a great running back. His nick name was swivle hips. Those of us that know him still call him that to this day. He is a special man with a fantastic family. Happy birthday Willie……..
Bill, Glad your day was great, and hope you enjoy many more of them. Charles “Cap” Bradley, friends since Greens Farms School. As someone who was at the party for Will Klemish I would like to salute the Klemish family who put on a real ‘do’. The Honoree was in fine form, eighty or not! Staples was very well represented by a crowd who has kept in touch over “lo these many years”. I say it again, Hope your 80th year is great Will!! Aptly put: “Once a Wrecker, always one.” The Staples Gridiron club, through much of the efforts of Dan DeVito, have kept that alive and well. God Bless. I would like to thank both Dan DeVito, Dan Woog & of course The Staples Gridiron Club for helping make Will Klemish’s 80th sensational. From one Wreck…..! oh I mean Wrecker always will be one forever! What a school!